“February half-term ‘Winter steam festival’ to go ahead as originlly planned. Ongoing ‘Storm Imogen’ damage and flooding has disrupted many rail services in the last few days, but the latest casualty is the steam-operated South Devon Railway (SDR) whose February half-term ‘Winter steam festival’ has been put at risk after a landslip blocked the seven-mile line. 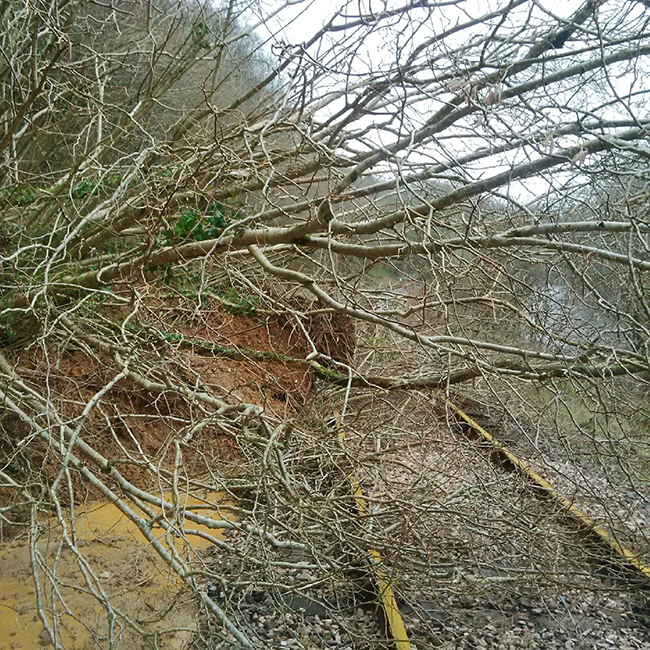 The landslip, affecting around 20 yards of track, took place sometime over the weekend of 6th & 7th February after staff undertaking a line inspection on Monday found their way blocked by fallen trees, soil and stone near milepost 1½ between Totnes and Staverton near Woodville. The rest of the line was also inspected yesterday but no significant damage found. The SDR had been busy this week getting ready to run steam train services for the nine days of the February half term ‘Winter steam festival’, but workers are now having to work against the clock to clear and repair the tracks in time. The railway usually carries several thousand people over the line during the February holiday period, so any loss of trains would be a big blow to the charity. But, subject to the weather and no more damage occurring, the SDR is very hopeful that all trains will run from Saturday 13th February to Sunday 21st February, and says it will confirm this later in the week after the area is cleared of debris and the necessary safety inspections have been carried out. The Railway’s Refreshment Rooms and Expressway Model shop will be open as normal. But, if the track and bankside repairs cannot be completed in time for the February gala to take place from this coming weekend, the SDR will reopen as soon as possible next week. The SDR suffered another serious landslip two years ago on Boxing Day 2013 which resulted in an enforced six-week closure of the line whilst several hundred tons of mud, stone and trees were removed and new drains and track installed. The news will be a shock to many local people and visitors who regularly enjoy the scenic ride down the valley of the river Dart from the comfort of a warm steam train at the start of the new running season.